You can make convenient deposits to your checking account in person, by mail, through Direct Deposit, Payroll Deduction, or at ATM locations. Our VISA Check Card works just like a check, except there’s no check to write. Simply present it as you would a credit card. The amount of your purchase is automatically deducted from your Share Draft (Checking) Account. You can also withdraw cash, make deposits, and verify account balances at thousands of automated teller machines (ATMs) worldwide. If you write a check for more than your account balance, available funds in your Share (Savings) Account will be automatically transferred to your Checking (Share Draft) Account. Apply for a $2,500 Overdraft Line of Credit to protect your good credit and increase your borrowing power. Please note: Federal law allows only six automatic electronic or telephonic transfers per month to an active Share Draft account. There is no limit to the number of transfers in person. Direct Deposit is the safest way to deposit your net pay, Social Security, or pension check(s) into your Credit Union account. Your money is electronically transferred and immediately available every pay period. Payroll Deduction allows you to have a portion of your net pay deposited directly into your Credit Union account(s). It’s a great way to establish a “no excuses” savings plan and to make loan payments automatically. Best of all, there’s no cost to sign up for either service. It takes only minutes to apply for Bethlehem 1st FCU’s Share Draft (Checking) Account and other convenient account access services. Sign up now to save time and money. Simply contact BTFCU at 610-691-0041 today! 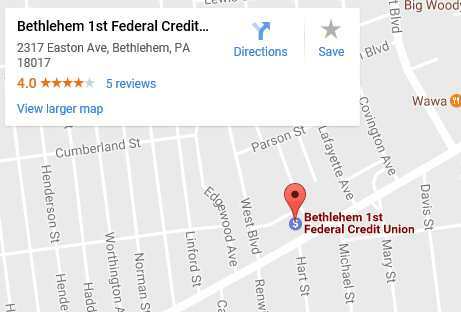 Bethlehem 1st Federal Credit Union is governed by the National Credit Union Administration (NCUA), a U.S. Government Agency. It is the credit union equivalent of commercial banks’ Federal Deposit Insurance Corporation (FDIC). The NCUA, through its insurance fund (NCUSIF) protects your shares up to $250,000 against loss due to the failure of a federally-insured credit union for any reason.